Dr. Valin G.K. Marshall was born on the Caribbean island of Carriacou, Grenada, and attended McGill University, Canada, University of Maryland, USA, and the Laboratoire d’Acarologie, Paris, France. He is a retired scientist and an adjunct faculty member at Royal Roads University, BC. His short biography is included in the contemporary directory: Who’s Who in Black Canada. In 1993, the BC Provincial Museum hosted a special Black History Event, and Dr. Marshall and others from that committee became the founding members of the BC Black History Awareness Society (BCBHAS). 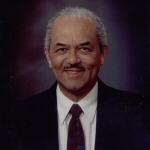 He was the society’s first vice-president from 1994-95, and continues to be active in BCBHAS, holding various positions on the executive and assisting in programs dealing with education and cemetery tours of BC Black pioneers.